Quite a hard concept to grasp, and at the moment I don't think we as viewers are supposed to be able to decode all the different character sets, only the one we have already managed to get a foothold on. Perhaps that was chosen as our puny, not cyber enhanced, brains might just be able to comprehend it ! 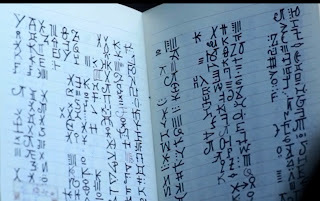 I found it very interesting that Astrid was decoding the notebook using a computer program that uses the symbols that we already know from the observer signage. Maybe she was using that language as a common reference of some sort. Talking of that computer screen, the symbols are recognisable, but as usual don't make much sense when translated to English. Elsewhere in the episode the only other translatable phrase was a very litteral affair. The lid of the box the transport cube was in says - "IT'S THE CUBE CASE"
Outside of the episode we now have the new RewardWire.org website. The site has lots of literal translations we can look at, but there are a couple of interesting points. First is the ? character appears to be different to what we have seen before, I was expecting this as before it has been confused with the / character. Second the uppercase U character is much clearer here and my original assumption about it seems to have been incorrect, so it's good that it has been cleared up. Also the individual information about the Fringe team has now been cleaned up, for instance previously the hair colour for Olivia was marked as Blond in English and Blonde in Observer, this has now been corrected. One final thing about reward wire is that when you move the mouse over the Report Sighting link, the observer equivalent is displayed, but before the correct character is displayed some seemingly random characters are displayed first. I think they are random and not part of a sequence but it may be worth seeing if there is a hidden message there. All that leaves us with is the updated language key, this has the correct U character, ? and the # discussed last week. Thanks, for the font link, that might answer a lot of the missing characters ! I'm travelling at the moment so will take a look when I arrive. I understood what Astrid was trying to explain a bit differently. 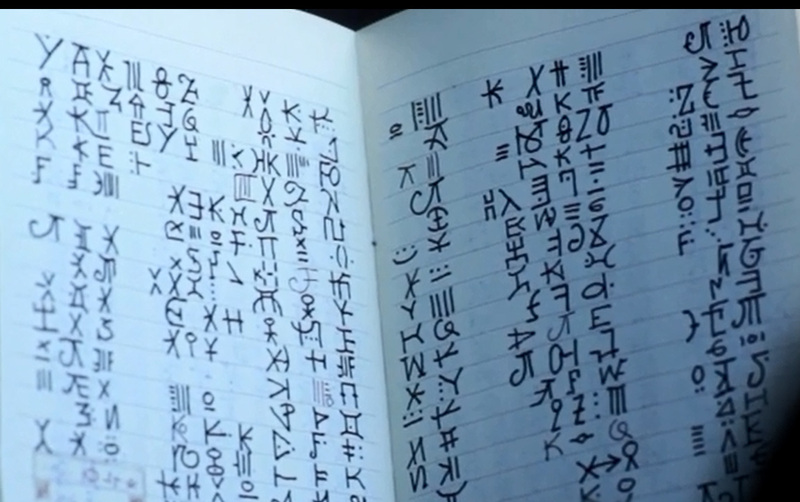 Maybe it's like Akkadian (Assyrian/Babylonian): it was written in cuneiform characters. There are hundreds of them and each had many different meanings. First, every sign had one or more syllabic/phonetic meanings, e.g., "ta," "at," "mi." Secondly, one could see it as the original ideographic meaning that a sign had in Sumerian (an older and unrelated language), e.g., "dingir" meaning "god." Again, one sign could have more than one "idea" meaning too, e.g., "star" and "god." This way an individual sign could have several possible readings. The only way to figure it out is through context and even then it's not always possible to decide on one meaning.